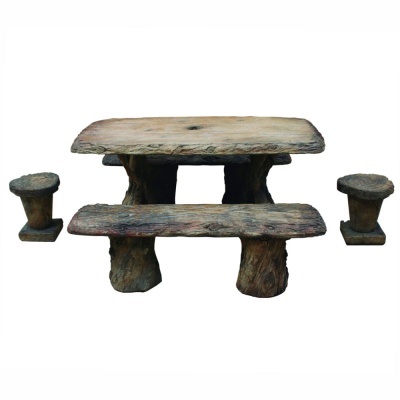 Henri Studio Woodlands Table Set provides a simply stunning outdoor (or indoor) cast stone rustic wood effect dining set, marvellously representing top quality workmanship and a delight to use. 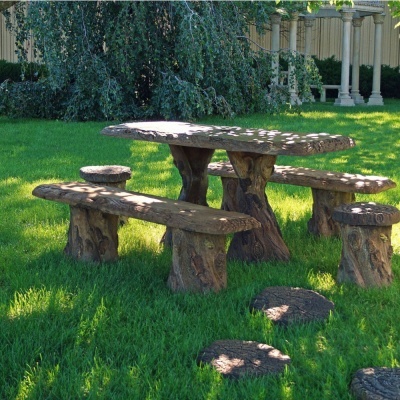 Cast stone crafted table, benches and stools delightfully resembling gnarled wood, the whole family will enjoy memories made sharing food, drink, games and laughter sat at this most wonderful stunning setting. Nature inspired, Henri Studio sculptors have excelled themselves bringing the woodlands to your suburbia back garden, using a relic hi-tone finish to achieve a mottled stained and weathered look. Henri Studio have even crafted a parasol hole within the stone table top suitable for providing your own choice of parasol,m if not seated under the canopy of a tree.